Thought you'd all enjoy this Web-only piece for the Las Vegas Weekly, responding to some slightly indirect criticism I received in CityLife. You may have heard that a few weeks ago, the nation’s most famous ex-murder defendant was picked up on armed robbery charges here in Las Vegas. Or you may have heard that the nation is mired in a seemingly unwinnable and endless war in some Middle Eastern country. Or you may have heard that there’s controversy over whether the president misuses his power to violate privacy, illicitly enrich his cronies and misinform the public. What? You mean you know about all of those things? Why, that cannot be! Or, at least, the editor of the other alternative weekly, Steve Sebelius, doesn’t think you could possibly be so aware. You’re all too stupid to know about more than one thing! I was more than a little amused to recognize myself as the fall guy in Sebelius’ column in CityLife a few weeks back following a fun little scrum he and I had on PBS’ Nevada Week In Review on Sept. 21. The biggest Vegas story of the week was the arrest and release of O.J. Simpson on charges he and a group of gunned-up thugs burst into a Palace Station hotel room to “retrieve” some sports memorabilia the ex-football star insisted was his. Now they face a slew of felony charges. I had covered this situation for The New York Times and acknowledged on the TV program that I was surprised – and grateful, at least from a bankbook point of view – that The Paper of Record had me following the saga on a daily basis as it first unfolded. I never pretended that it was the sort of story that actually made a difference in people’s lives, but whether the fate of the nation is at stake isn’t the only motivation for committing journalism. Sometimes it’s just interesting and weird, and the central figure of the Trial of Last Century being caught up in such a ridiculous scheme in a place as prurient as Las Vegas has all the elements of something interesting and weird. Only in Vegas would a study that shows that premenstrual lap-dancers get more tips make front-page news. Still, Abigail Goldman's piece in the Las Vegas Sun is ickily fascinating. As Miles might say: Ew. My piece for USA Today from the meeting of the International Society of Hair Restoration Surgeons is online here and is getting lots of interesting discussion about baldness in the comments. Fun! The Strip is LIVE @ 7 pm PT with PETE ROSE! Join us at 7:05 pm PT tonight at LVROCKS.COM for another rollicking edition of "The Strip," this time with Pete Rose. Pete discusses his gambling scandal, why he sympathizes with Paris Hilton and why he's spending 15 days a month signing baseballs and jerseys at the Field of Dreams memorabilia shop at Caesars Palace. Plus, Steve reveals all about his Rose-inspired gambling bender, the week's Vegas news, the trivia question, the poll, your feedback and as always the TOP SECRET TOURIST TIP OF THE WEEK. Come to the chat room, stay for the when-will-Miles-cuss drinking game! Or be that way and wait till Thursday for the podcast version. Design Problems at CityCenter Shopping Center? "It’s harder to know what sort of philosophical underpinning Libeskind has in mind when he’s dealing with a luxury condominium or a Las Vegas shopping mall. “I don’t look at an apartment building and think, How can I subvert it?” Libeskind says. “With a shopping center, I can’t touch the machinery of shopping, but I do want to make it more successful.” His demonstrated ability to steer crowds through an awesome interior landscape can of course be very useful when the subject is shopping rather than the history of German Jews. But meaning is something else." Next up is Las Vegas, a retail center with public spaces that is the centerpiece of MGM Mirage CityCenter, a huge new development on the Strip involving half a dozen architectural teams. Swickerath has just come back from Nevada with photos of a full-scale mock-up of the entrance canopy, a scaly metal skin like a dragon’s hide. The diagonally pitched titanium panels aren’t behaving as they had on paper. Seams aren’t aligning properly, and one side has developed an unsightly crimp. When I press Libeskind on how he can reconcile the idealism of the Cranbrook days with the task of building a luxury Las Vegas mall, he says that the restrictions have changed, but the goal is still the same: to give a world of simulacra something original and real. Just down the street from his site is the Venetian, where visitors can cross fake canals to pseudo-piazzas beneath programmable sunset skies. Libeskind describes his own contribution as a “rich, urbane, cosmopolitan scheme, one you could find in New York or in Paris.” Rather than sit far back from the street in the manner of other local pleasure domes, such as the Bellagio, this mall hugs the sidewalk the way buildings do in Manhattan. His gallery is high and topped with glass, letting in natural light, which casino developers generally treat as if it were a poisonous substance. Whether Libeskind can help coax Las Vegas, or any city, into another Rome will depend in part on how many projects he takes on. An architect who wants to leave his mark needs developers just as much as they need him." What a shame that, as profound as Libeskind wishes to be, the Forum Shops at Caesars already did an expansion that "hugs" the sidewalk of the Strip. But this insight did intrigue me and I wonder how they'll be fixing this problem. Read the whole thing, if you must, here. I'm in Minneapolis for the day for some personal business and I figured I'd visit the now-famous Larry Craig Restroom at MSP, which has become a bit of a tourist destination. The stalls where the Idaho hypocrite destroyed his Senate career was, surprisingly, very busy, as you can see below, at 6:30 a.m.
As you can see above and below, they were occupied. No harm in that. But. All three of them at the back corner were occupied. One even had a a rolling bag blocking the view of the feet. And I was in no hurry. I really wanted to see if there was any sort of graffiti on the walls. After 20 minutes, though, none of the three people in the stalls exited. They were either all having constipation problems or...well... whatcha think? What's sort of amazing, beyond the fact that this is a notorious site that, according to reports has become a popular attraction for weird, camera-equipped bloggers such as myself, is that there are many public toilets at MSP in more remote and less heavily-trafficked areas. How is it that this one, right at the heart of a food court and busy shopping area and just behind the main ticketing counter, is the one used for this sort of activity? Either way, the MSP's reported planned remodel of this bathroom can't happen too soon. Amazing. Almost amazing as this item on Larry Craig's wife's tuber recipe. Stranger than fiction indeed. WHY DO THEY ADVERTISE THIS? I've ranted about this before on the show, but that was before I had a blog, so now I can show you all what I mean. 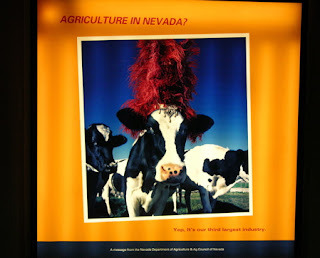 At McCarran Airport in Las Vegas, there's this lighted billboard showing a cow in a headdress, the headline you can see that reads "Agriculture in Nevada?" and the small print below the cow that reads: "Yep. It's our third largest industry." It's a message from the NV Dept of Agriculture and something called the Ag Council of Nevada. Can someone -- anyone!!! -- explain to me the purpose of this billboard? What, do they think that tourists from Wisconsin are going to see it and say, "Y'know, maybe we'll just stay here and become farmers!"? That's the best I can do. Anyone? I Googled Ag Council of Nevada. The first thing that pops up is the Ag Council of Northern Nevada, but when you click on it, it's a placeholder site. After that, the closest option is this one, Nevada Agriculture Education, which shills for a Nevada Agriculture license plate, shown here. I've never seen anyone driving around with one. And the best they could come up with for a subline is "People Grow Things Here." Wow.